St. Patrick's Day is coming up on Tuesday, March 17th! If you're in the market for some last-minute goodies for the day, have a look at this handy list. As of this writing, everything here is in stock and ready to ship with fast Amazon Prime shipping. Pick 2-day shipping at checkout to get your last-minute St. Patrick's Day gear in time for the big day. Decorate your St. Patrick's Day party with this set of six dangling shamrock string decorations. Shamrocks in two sizes hang down. Use these decorations against a wall, around your room, or hang them together between rooms or as a novelty room divider for your fun party day! This design is a take on Robert Indiana's famous pop art LOVE designed in 1965 and turned into a popular postage stamp in 1973. Here instead of a turned 'O', a lucky shamrock replaces the letter. This kelly green shirt is great for St. Patrick's Day! Note: fast Prime shipping available for certain sizes only. Decorate your skin with green lucky four leaf clovers! This set comes with green clovers in all different sizes so you can mix and match your look with all of your friends. Safe for the face or anywhere else you'd like a St. Patrick's Day temporary tattoo! Dress up your dinner table for your traditional corned beef and cabbage feast with this stylish and elegant lace table runner. The runner has pretty green and gold shamrock floral details. Become your group's jokester with this fun jester hat in green and white. The hat has three long drooping points that end in dangling green and white shamrocks. One size fits most with the attached adjustable Velcro strap. 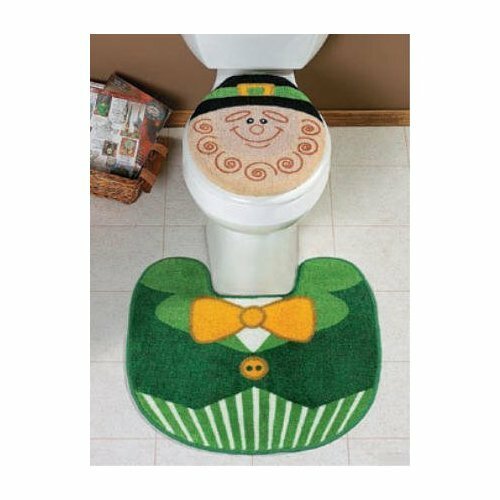 This design is hot seller for St. Patrick's Day this year. The retro-style oversized shamrock motif is white with thin negative horizontal stripes. The shirt is a nice dark forest green. Note: this is a size small shirt. Pick up this inexpensive fun party game for your St. Patrick's Day festivities! The set comes with two game die pieces. One cube has various dares on it, while the other has locations, partners, or other stipulations. Roll the oversized green dice and see what they dare you to do! This is a funny drinking shirt for St. Patrick's Day party fun. Going on a pub crawl, or staying at your favorite Irish inn all night? Where ever you're partying, you'll get laughs when you wear this funny shirt with a poor leprechaun puking up his lucky charms. Get lucky on St. Patrick's Day with this hot accessory set. 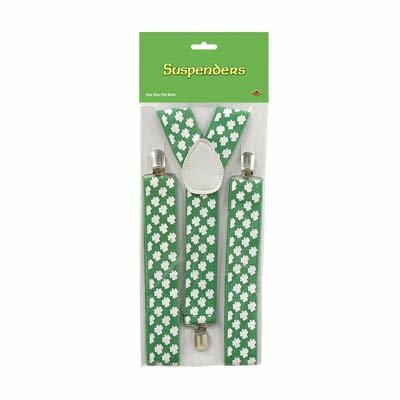 You'll get a bright kelly green vest with matching suspenders. 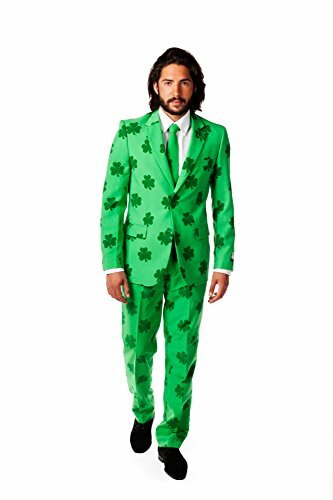 You'll also get an oversized matching leprechaun hat, a green bow tie, and a four leaf clover arm band that reads KISS ME. Note: this outfit does not include pants. These highly-rated stockings are a fun St. Patrick's Day accessory. The stockings reach thigh-high and are striped kelly green and black. Note: one size fits most.